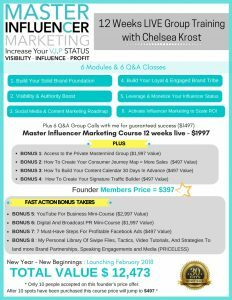 Are you ready to learn how to increase your VIP Potential and BOOST visibility, influence, and profits for your brand and business? Are you looking to stand out from the competition, make a bigger impact on social media, cut through the clutter with your content, and land opportunities like press and speaking engagements? Move over celebrities, INFLUENCERS are the big power players today! In fact, data from MuseFind shows that 92% of consumers trust an influencer more than an advertisement or traditional celebrity endorsement. The time is NOW to empower yourself with the know-how to establish and scale your digital footprint in the New Year. Don’t leave experience, opportunity, and money on the table!